The long-running advice to use a wet tea towel to tackle chip pan fires is being scrapped by the government. When faced with a blazing pan of fat the public will now be advised to "get out, stay out and dial 999". The Department for Communities and Local Government has changed its advice for fear it did more harm than good. 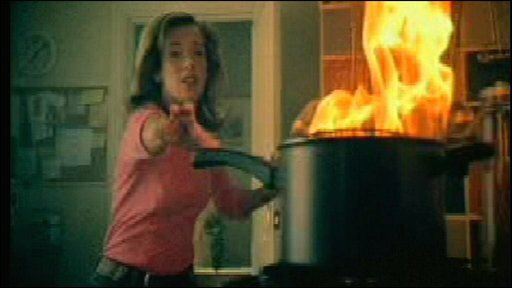 Most chip pan fires are caused by men cooking after they have been drinking, officials said, and caused 4,900 injuries in 2006. The DCLG found 43% of chip pan casualties took place between 8pm and 4am and more than 30% between 10pm and 4am. Many of the fires were "caused by late night cooking, particularly by men under the influence of alcohol," officials said. But the advice, contained in public information films, most recently featuring celebrity chef Keith Floyd, could be putting people in harm's way. 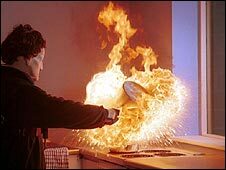 In new guidance Britain's fire and rescue authorities are urged to review what they tell the public "in view of the significant number of people who are injured in fires started by cooking appliances". "As householders are not trained to deal properly with fires, they would potentially face severe injury or death if their attempts to extinguish fat or chip pan fires were unsuccessful," the document says. "The wet tea towel advice is also contrary to all other advice we give to the general public about not tackling fires." Firefighters have also been advised to change their demonstrations to the public of the dangers of leaving chip pans unattended. But, the policy update adds, demonstrations "can still be used to show the devastating effect of putting water on a flaming chip or fat pan".